Both Lionel Messi and Cristiano Ronaldo are now out of the World Cup. A brace by PSG star Edinson Cavani helped Uruguay beat Portugal 2-1. Cavani opened the scoring early in the first half when he headed home a cross by his compatriot Luis Suarez. Cavani topped of his first half header with a brilliant curler in the 62nd minute, which ultimately proved to be the winner. Ex-Real Madrid man Pepe scored the equaliser for Portugal in the 55th minute following a cross by Raphael Guerreiro. 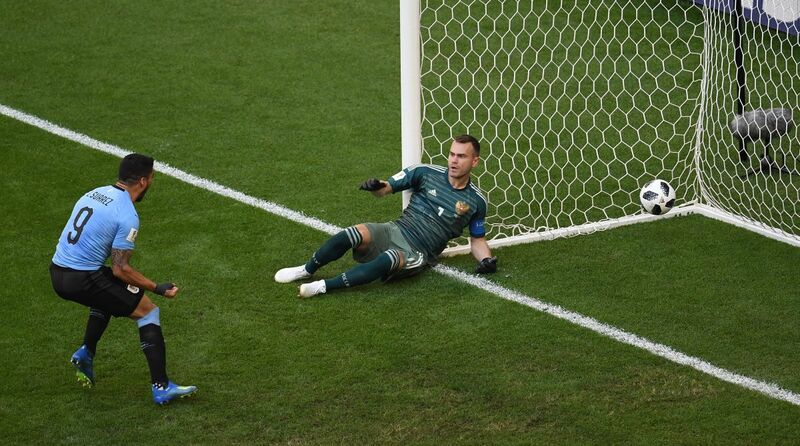 Uruguay had not conceded a single goal in this World Cup so far. Although, they could not keep their record in tact but they put up yet another defensive masterclass. Uruguay’s victory means that they will now face France in the quarter-finals. France had earlier won 4-3 against Argentina in a high scoring encounter. A lapse of concentration led to Portugal’s goal but others the Uruguay defence was rock solid throughout the game. Diego Godin and Jose Gimenez kept Ronaldo quiet for most of the match and youngster Diego Laxalt has been a revelation at this tournament so far. Portugal had more possession in the match but lacked the spark as they couldn’t create many chances. Whatever they did, Uruguay’s defence had an answer to that. Arsenal Lucas Torreira was also very impressive as made many clearances and last ditch tackles during the match. Ronaldo failed to do much as he lacked the support of his team mates as Portugal lacked creativity In the midfield. Man City youngster Bernardo Silva showed sparks of brilliance but failed to deliver the final ball. After today’s defeat, both Messi and Ronaldo are now out of the 2018 FIFA World Cup as both will head home disappointed. Fans were hoping for a victory for both Argentina and Portugal so that they could witness a Messi vs Ronaldo World Cup quarter-final, but now they will get to see neither of them.